World Economies research papers discuss the history of economics around the world. Research papers on world economies discuss the economic aspect of the global community and how one nations economic status affects others. The economic history of a world economy can also be studied. The economies of all of the world’s nations are, in one way or another, linked together. For much of the twentieth century, the world’s economies were divided in two: communist or capitalist. While the end of the Cold War greatly reduced the number of, and influence of, communist economist systems, there are still several major state-controlled economies in the world, especially China, one of the world’s largest. When aggregated, however, the European Union has the largest GDP in the world, making it the biggest economy in the world. 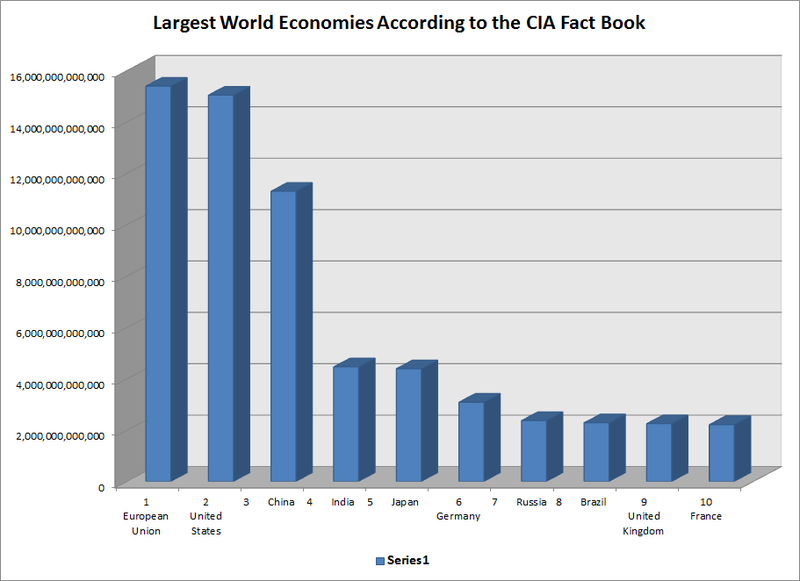 According to estimates, the world economy was worth some $83 trillion. China, the second largest of the world’s economies, practiced a Soviet-style centrally planned economy from 1949 to 1978. After Mao’s death, the government began moving towards a mixture of free market and state control. Modern China can be characterized as having a market economy based on private ownership controlled by a single-party government, known as state capitalism. Under this hybrid system, China has grown to become the world’s largest trading partner. The interconnectedness of the world’s economies was highlighted in 2009, when widespread deregulation of the U.S. financial market led to the Great Recession, which deeply affected not just the U.S., but Europe and Japan as well. Capitalism and the Worker - This research paper topic will argue that there is an inherent disjunction between the interests of labor and owners in capitalistic America. Soviet Union - We do your research and writing on the empire during the Cold War. Mao Zedong Research Papers explore one of the most influential person's in China in the twentieth century. Mao Tse-tung Research Papers delve into the life of one of the best and worst rulers in China. Capitalism and Government - The government and capitalism have long gone hand in hand in the United States. US Economy is Entering a Recession - Does this US Economy is Entering a Recession assignment look familiar? Many professor's assign topics just like this and our writers custom write each one. The Organic Machine - The Organic Machine book reports discuss a book by Richard White that human history and natural history are intertwined. Post-War U.S. Economic Policies - Post-War U.S. Economic Policies research papers look at the break-up of the Bretton Woods system and the current state of several key countries such as Japan. The Lexus and the Olive Tree - The Lexus and the Olive Tree Research Papers discuss a capitalists point of view of globalization. A Davos World Economic Forum - A Davos World Economic Forum research papers discuss the meeting of business leaders and economists as they go over the world's recovery from the largest financial crisis since the Great Depression. National Council of Social Studies - The National Council of Social Studies was founded in the United States 1921 to encourage social studies education and social studies lesson plans throughout the country. Singapore Trade - Singapore Trade Research Papers look at the newly industrialized country as one of the busiest ports in the world and discusses the imports and exports. Population and the Third World - Population and the Third World Research Papers discuss the many issues of population control. Secondary Education - Secondary Education research papers discuss the key issues in the development of a secondary education. Paper Masters writes custom research papers on World Economies and discuss the history of economics around the world.